Group tickets are a great way to get everyone together for an action-packed, fun-filled time. Grab a group of 12 or more and get special single-game pricing. Purchase a group of 100 or more and have members of your group get to come down onto the field pre-game to hold the Canadian flag during the national anthem. 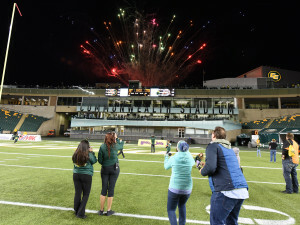 Bring out a group of 50 or more and have your group be a part of an amazing Eskimos tradition as they are joined by legendary sports broadcaster Bryan Hall to help lead the performance of the Eskimos Fight Song! 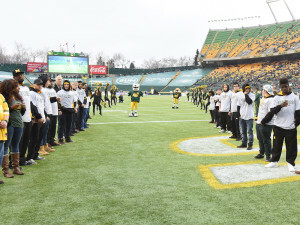 Bring your minor football team out to the game and give your players the opportunity to be a part of our fan tunnel on field as the Eskimos come out from the tunnel pre-game. Bring your team, business or other group of 100 or more and enjoy the opportunity to have use of Clarke Stadium from 2 hours prior to the game until an hour prior to the game. Use of the field is limited only by your imagination. In addition, your group will then be able to join us down on the Brick Field at Commonwealth Stadium post-game, providing a great photo opportunity and some legendary memories. Have your group join us on the track for pre-game warmup! 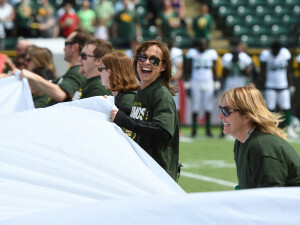 Catch all the action of warmup from right at field level and have a chance to see your favourite Eskimos up close.